Instead of saving up for a flight ticket to your next holiday destination, why not pack your bags for a weekend getaway at Bintan? Less than an hour ride away from Singapore by ferry, the Indonesian island's sandy white beaches, grand golf courses and gorgeous resorts make it the perfect beach vacation sans the obnoxious crowds of Bali or Phuket. Even if you're not one to soak up a tan or relax with a spa session, the island is loaded with a range of heart-pumping land and water activities as well as idyllic nature trails. 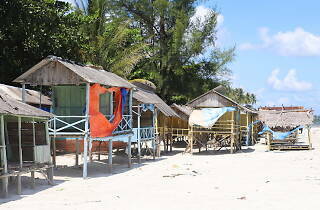 Alternatively, you can learn more about Bintan by embarking on a cultural and heritage trail. Ready for an adventure? Here's our guide on where to stay, eat and do at Bintan. Bintan's largest integrated resort, this tropical paradise boasts top-notch deluxe accommodation including 450 rooms, suites and villas. Each room features amenities such as a furnished private balcony with stunning views overlooking the majestic South China Sea, high-speed Wi-Fi and suites have interconnecting rooms for large families or a group of friends. But if you're travelling in a group, you'll want to splash out for a villa. 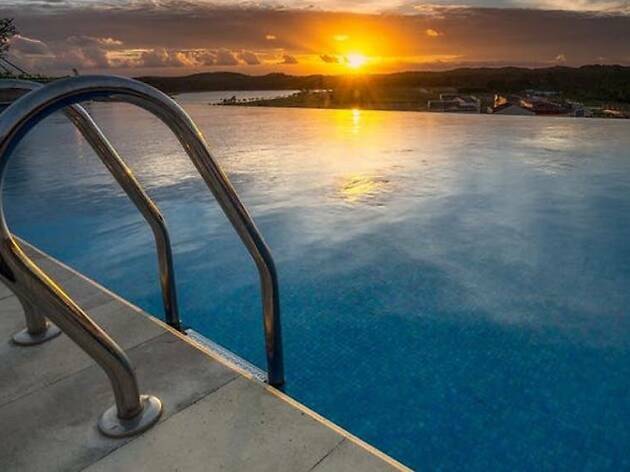 Equipped with a kitchen complete with cooking and dining utensils, three or four rooms, private pools and barbecue pits for most – it's perfect for a seaside party. Make the most of your stay with a game of golf at its world-class 18-hole golf course, take part in land activities such as archery, paintball and an ATV drive or take it easy and sign up for cooking classes or batik painting sessions. After a long day, pamper yourself with a spa day and more. There's always something for the whole fam. 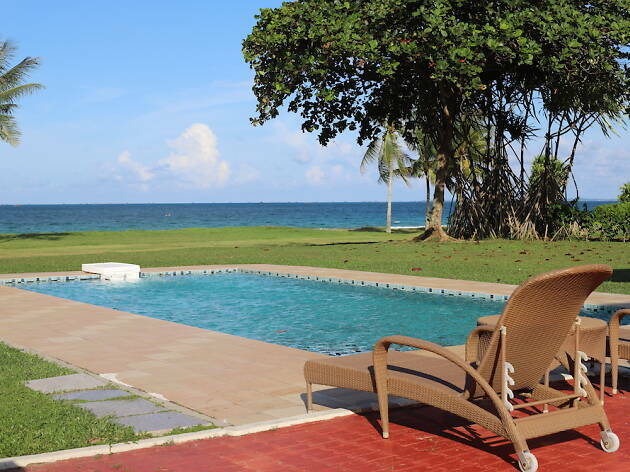 Visit bintanlagoon.com for rates and reservations. Glamping is the new camping and what better way to spend the night than next to the region's largest man-made seawater pool – the 6.3 hectare Crystal Lagoon. 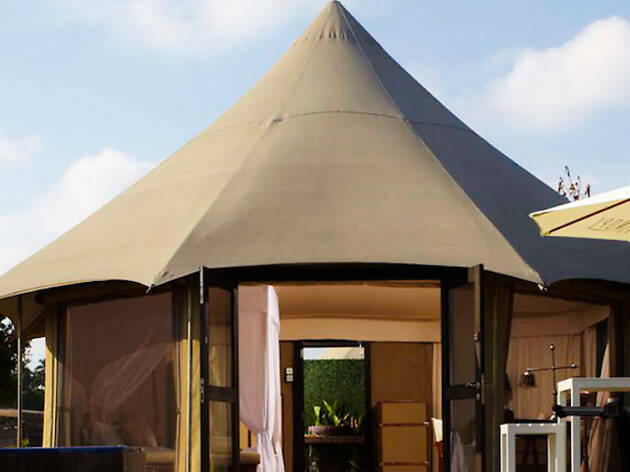 Forget setting up your tiny tent, the luxe safari-themed tents here are massive and well-equipped with four-poster beds, outdoor jacuzzis, Wi-Fi and a private garden for a barbecue or stargazing. 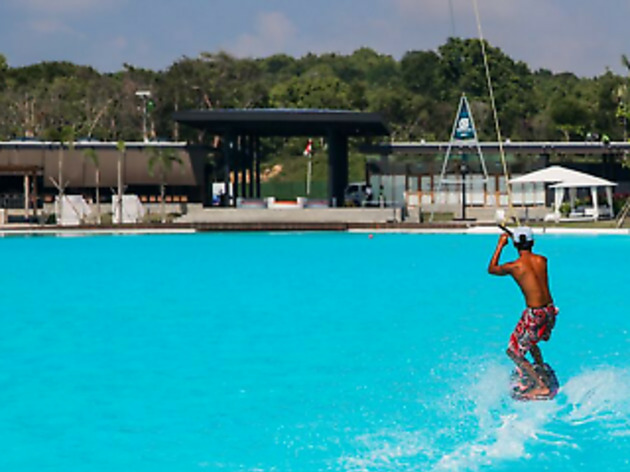 The resort is also a land and water sports playground where guests (and even non-guests) can jetski, stand-up paddle, wakeboard, drive an ATV and motocross ride across the gargantuan space. Visit thecanopi.com for rates and reservations. Prefer the suite life? Tucked in the rustic and quaint part of Northern Bintan, this four-star hotel has you sorted with 132 rooms as well as facilities and services including a rooftop infinity pool with a panoramic view of the Lagoi Beach and two modern restaurants serving both Western and Asian cuisines. Right at its doorstep is Plaza Lagoi for a spot of shopping and the Lantern Park where you can snap illuminated installations for the 'gram. Visit grandlagoihotel.com for rates and reservations. 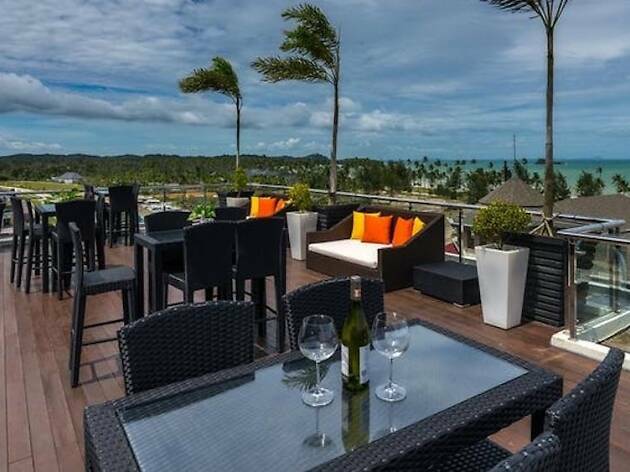 Dine with a seaside view at one of the top restaurants in Bintan. Facing the stunningly blue South China Sea, Nelayan at Bintan Lagoon Resort offers an extensive Indonesian and Western menu featuring fresh seafood and delectable grilled meat. Coupled with the gorgeous view and a cooling breeze from the sea, this al fresco restaurant makes the perfect venue for romantic celebrations. We'll let you in on a secret: opt for the table d'art menu for an interactive experience – the chef serves dishes fresh from the pan, seasons and decorates your meal on the spot. Jl. Indera Segara Site A12 (+62 770 691 388 or +65 6223 3223, Bintan Lagoon Resort). Lunch: noon-3pm, dinner 6pm-10pm, bar: noon to 10.30pm. Head to the topmost floor of the Grand Lagoi Hotel and dine under the stars at the hotel's signature al fresco restaurant. Savour the Asian and international flavours of its selection of grilled meats and seafood, coupled with tantalising cocktails to unwind after a day of exploring. We recommend coming during the evening to truly enjoy the amazing sunset dining experience. Jalan Gurindam Duabelas, Plot 27 & 29 Sebong Lagoi (+62 770 692988 or +62 212512 129 or +65 6213 5830, grandlagoihotel.com). Daily 4.30pm-10.30pm. 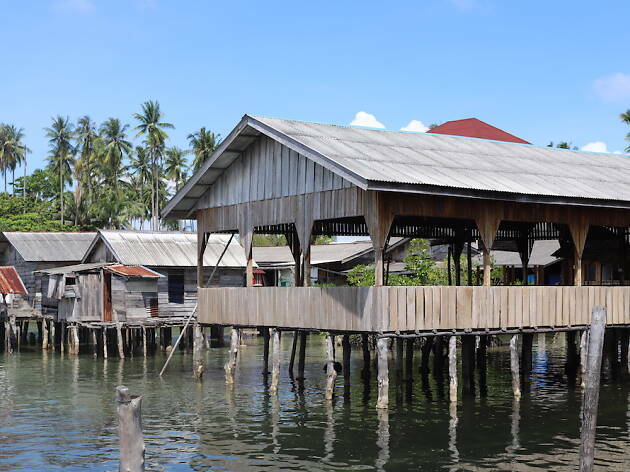 For the uninitiated, kelongs are floating platforms built on stilts that are used for fishing and are usually found in the waters of countries like Singapore, Malaysia, Indonesia and the Philippines. 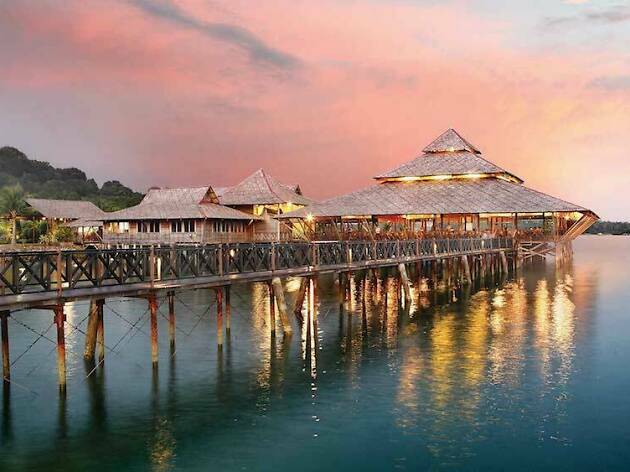 Located at the western coast of Nirwana Gardens, the floating Kelong Seafood Restaurant offers the freshest seafood in Bintan. Dine on its signature dishes like gong-gong (sea snails), black pepper crab and stir-fried butter prawns cooked in a unique blend of Chinese and Indonesian culinary styles while soaking up the stunning view and enjoying the balmy sea breeze. 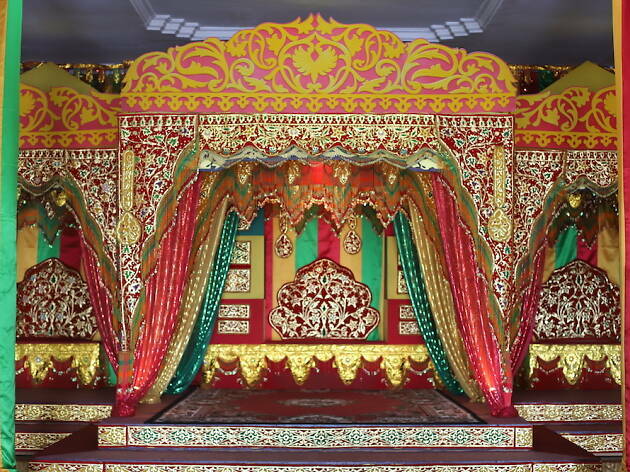 Jalan Panglima Pantar (+65 6323 6636, nirwanagardens.com). Daily 11am-10.30pm. Indulge in the true taste of Indonesia at this vibrant food court located on the second floor of Plaza Lagoi. With plenty of stalls selling affordable Asian fare like bak kut teh (pork ribs soup) and local delights such as the goreng pisang keju (fried banana fritters with cheese) and bakso (meatballs), you'll be spoilt for choice. But once you've made your order, head to any of its Instagram-worthy booth seats shaped like tiny houses and life-sized birdcages for a photo opportunity with your meal. But eat it fast before it gets cold! Plaza Lagoi Block A (+62 770692917 or +62 770692918, bintan-resorts.com). Daily 10am-9pm. Get your heart pumping and adrenaline flowing with water activities surrounded by the sun, sea and sand. Slip into your swimwear or wetsuit and make your way to the first and largest man-made saltwater lagoon in Southeast Asa – the Crystal Lagoon – for various water activities. The water playground offers over 10 water sports. Burn your energy with a hand at the bumper boat, water tricycle, water stand-up paddle, inflatable kayak, water ZOVB, the Jetovator, cable ski, slip and slide and more. Channel your inner Tiger Woods and challenge yourself at two award-winning 18-hole championship courses at Bintan Lagoon Golf Club. Grab a golf club and head over to the Jack Nicklaus Seaview course which features sculpted bunkers and water hazards on 13 holes. The best bit? Set by the South China Sea, the signature 12 hole allows golfers to challenge themselves against the breathtaking backdrop of the crystal blue sea. 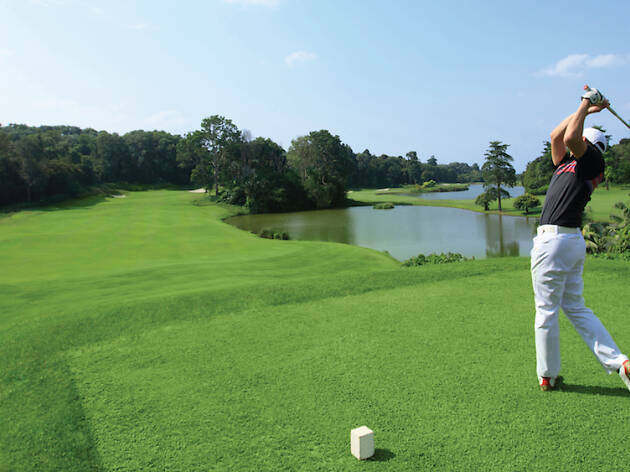 For avid golfers, visit the Ria Bintan Golf Club for some serious hitting. A dedicated golf course, the Ria Bintan Golf Club is a 27-hole championship course designed by Gary Player and is surrounded by the natural forest-scape and stunning coastal ocean features. The gorgeous place was nominated as one of Golf Digest’s Top 100 Courses, and even managed to squeeze in accolades like Asian Golf Monthly’s Best Golf Course in Asia and Best Golf Course in Indonesia under its belt. Get off the beaten track by taking a ride on various recreational vehicles available in Bintan Resorts. 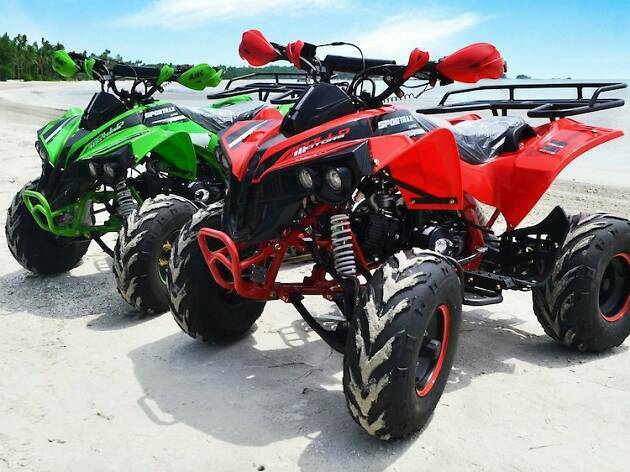 Brace yourself for a rough ride through the rugged terrain of the island on the ATV. Warning: you’ll get covered in mud, so dress for mess. For breezier alternatives, hop on the electric scooters or the 2-wheeler personal transportation to navigate around with the resort. Before you leave the island, be sure to visit Plaza Lagoi. 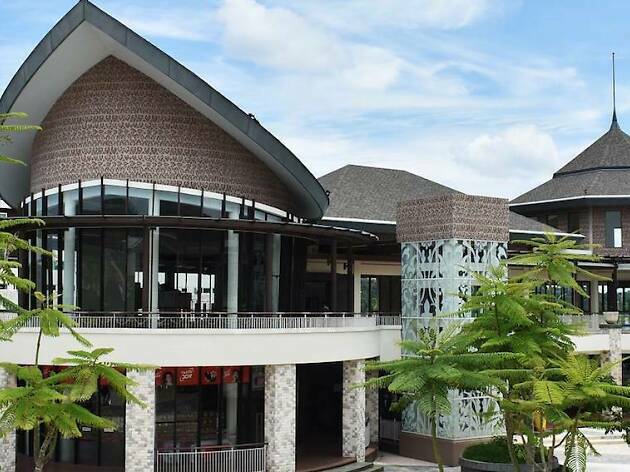 The modern shopping centre has a plethora of retail offerings including Indonesian gifts, souvenirs, fashion, art and more. Take a break at one of its dining options like Warung Yeah! for affordable local delights or head to the spa for a rejuvenating fix. 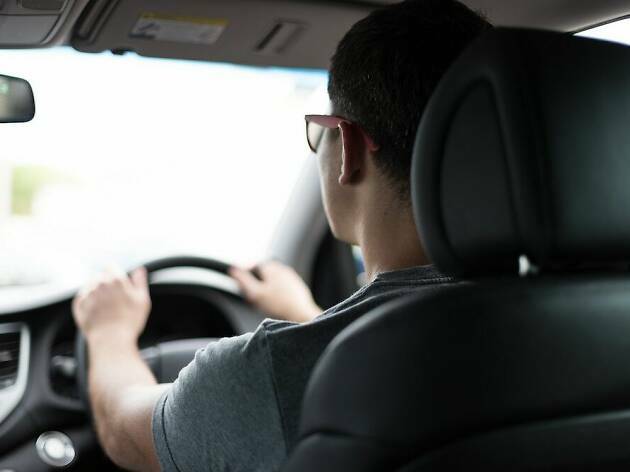 Most resorts provide free shuttle services to and from the shopping centre. Come night time, follow the kaleidoscopic lights to Lagoi Bay Lantern Park where you can capture beautiful moments while strolling down the pathways surrounded by 21 illuminated lanterns in a myriad of colours. 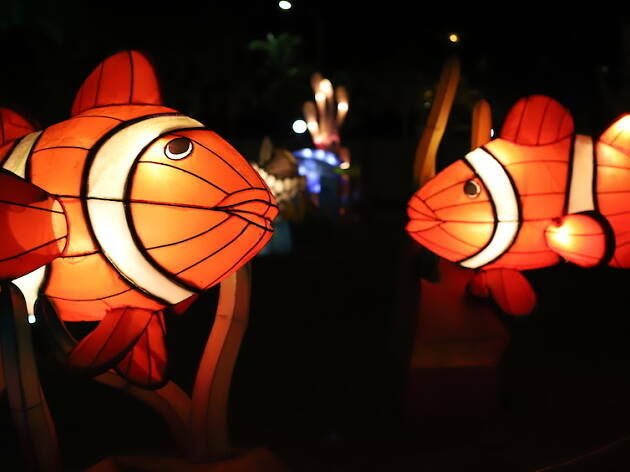 The lanterns take the shape of sea creatures like clown fishes, sharks and a massive octopus where you can pass underneath, as well as land species that are commonly found in Indonesia such as the Javan rhinoceros, Komodo dragon and Sumatran elephant. Whip out that camera for Bintan’s very own trick eye museum. 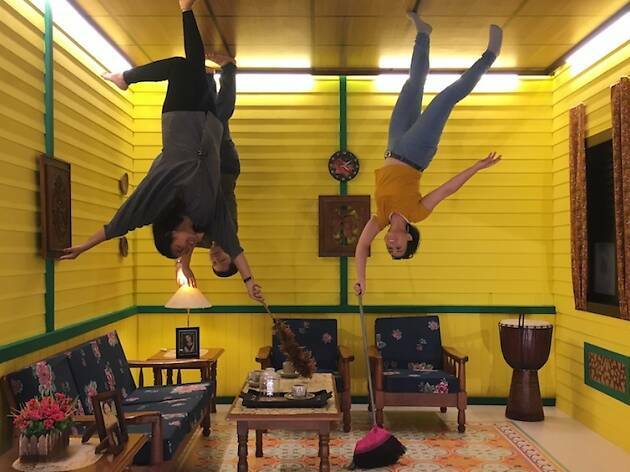 There are over 50 different 3D settings including inverted ones such as the interiors of a traditional Malay kampong and interactive ones dotted around the space. Not only is it great for the ‘gram, but it’s a fun immersive experience for the whole family. Once you’re satisfied with all your snaps, find the perfect memento to take home at the gift shop and stop by Food Stargram for the a quick bite. Pamper yourself to a day of relaxation with an authentic Balinese or deep-tissue massage session at Banyan Tree Spa. 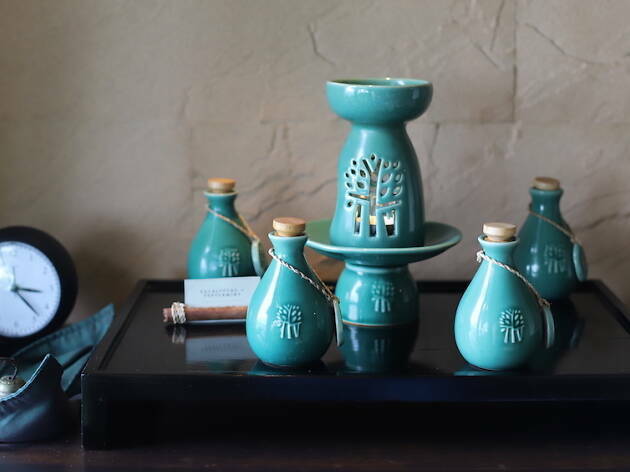 Most of the treatments here use essential oils and fuse traditional and modern western therapies to soothe both the mind and body. To allow the masseuse to truly understand the type of treatment you seek, there will be a mini consultation prior to your treatment. Once that’s all sorted, let the masseuse work his or her magic against the picturesque view of the sea. 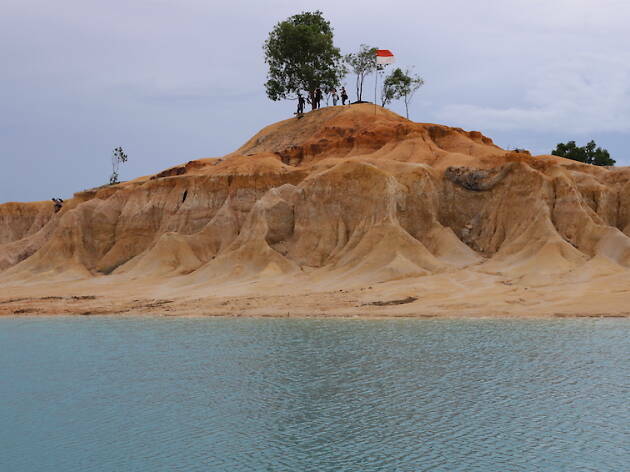 Travel back in time at this rustic village occupied by the Orang Laut – or Sea Gypsies. Observe the way the locals live as their ancestors did. Most of the village occupants are fishermen who rely on the ancient rituals and practices to determine their catch instead of the advanced technologies used by modern fishermen. It’s an eye-opening (and refreshing) experience away from the hustle and bustle of the modern city life. From the city of Tanjung Pinang, board a pompon (water taxi) and step onto the land where old royalty resided and currently rest. Hop onto a beak (motorised trishaw) and zoom through the village, visiting various historical sites such as the palace ruins and royal mausoleums that were once significant during the last phase of the Malay Kingdom. The Masjid Raya Sultan Riau was awarded the Certificate of Excellence by TripAdvisor, while all the attractions on the island are pending listing as UNESCO World Heritage Sites. Rumah Arangs are dome-shaped charcoal kilns made of bricks that were used by the locals to burn mangrove wood into charcoals during the 90s. 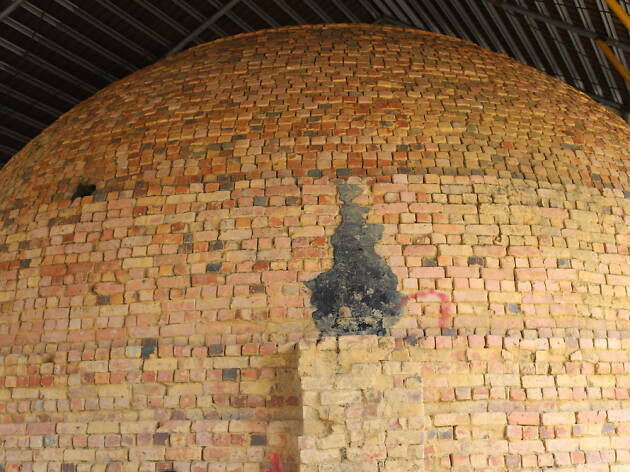 These charcoal kilns are no longer in use after the Indonesian government prohibited the production as it harms the environment. However, you can still find these empty dotted around the island. Built over the sea, this old village was home to the first group of Chinese immigrants on the island. Here’s where you can also find some of Bintan’s oldest Buddhist temples including the Lau Ya Keng which houses the four temples that pay homage to the different deities. 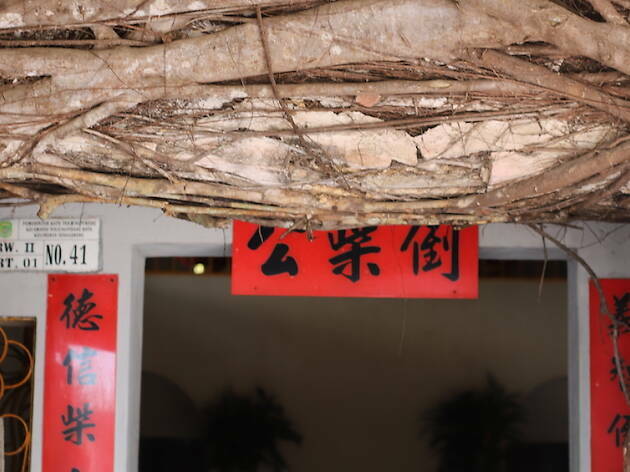 But make your way around the corner to find the Banyan Tree Temple where trunks of ancient trees intertwined around the temple, becoming a part of its architecture. 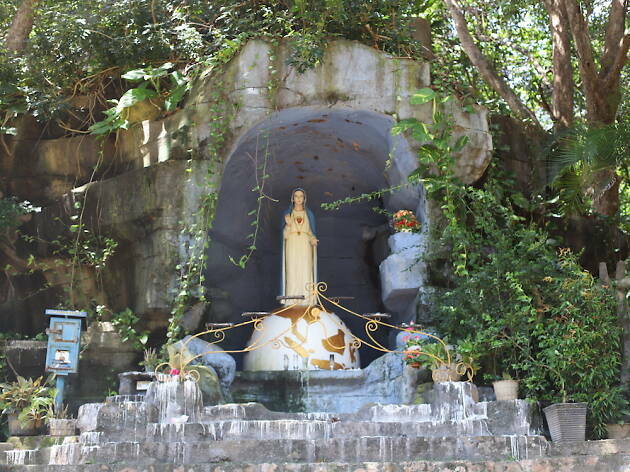 Located opposite Trikora Point 4 and close to Panglong Village, this small quintessential chapel and a well-preserved statue of Santa Maria can be found. It is said that the old religious site was built by a French priest with newer additions contributed by refugees from Vietnam and the Catholic community from Singapore. 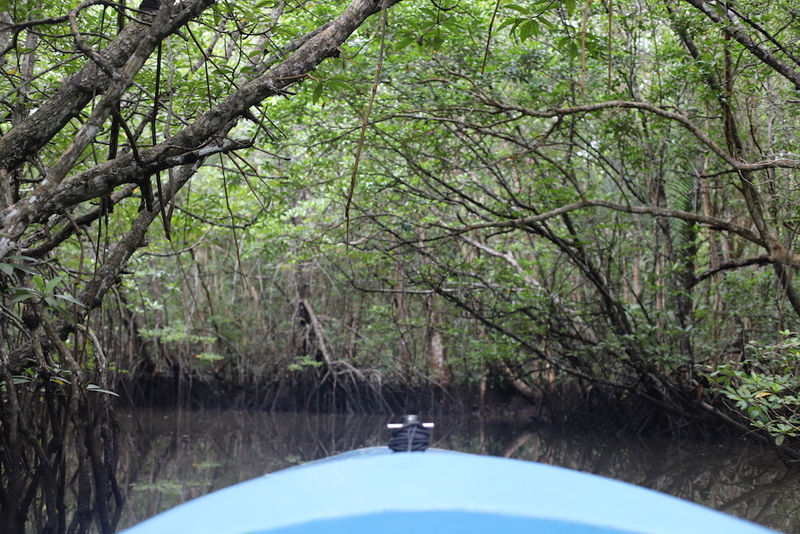 Discover the wonders of the island’s mangrove forests which are significant in the control of soil erosion and filtering siltation of seagrass beds and coral reefs from reaching the shores. 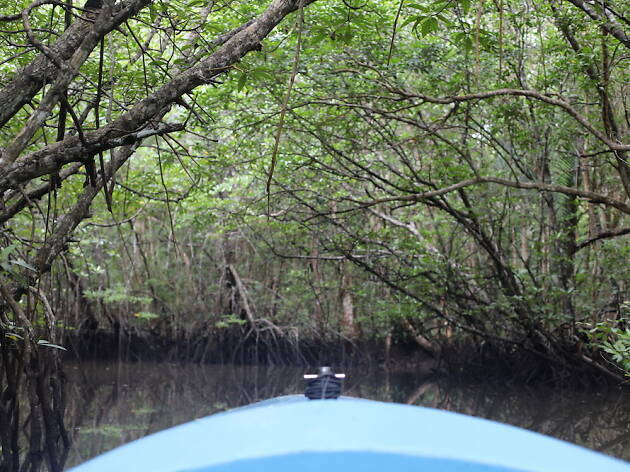 Follow the Sebung River and witness wildlife around you, from a snake coiled around a branch and monkeys hanging on the trees to a crocodile lounging in the corner and birds circling the bright sky. Don’t skip the night tour as you’ll get to see (and catch!) plenty of fireflies that light up your journey through the river. Believe or not, there’s a desert in the middle of this tropical haven. Surround yourself with sand dunes and crystal blue lagoons which gives you the perfect National Geographic money shot. The site used to be quarried for sand mining but years of abandonment caused the sand to form mounds that mirror those in the desert. There are plenty of photo opportunities, so go wild and snap away. 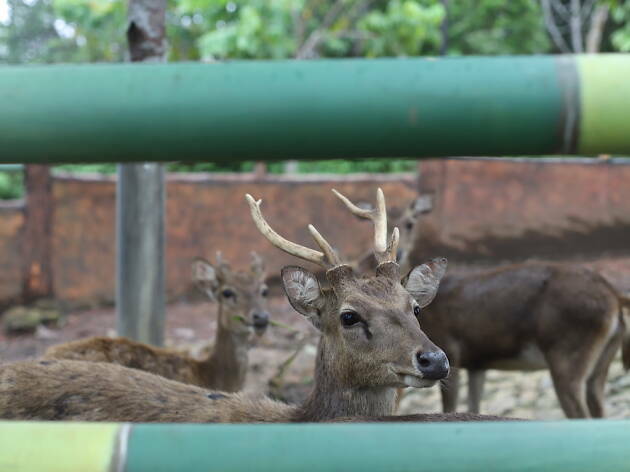 Home to many rescued and endangered animals including the orang-utans, Komodo dragons, sun bears, Asian elephants, crocodiles and more, the sanctuary also doubles as an eco-farm that harvests rice, corn, dragon fruits and other seasonal crops. 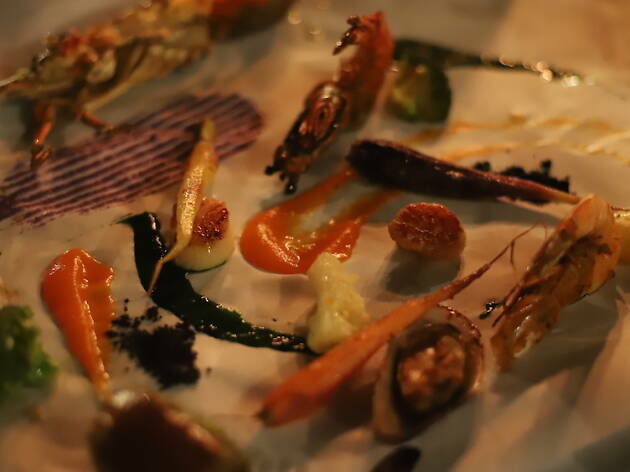 It’s a great way to witness local produce in their most natural states. Wrap up the day at Safari Lagoi with sweet rosella tea, fresh fruits and rojak made from ingredients harvested from the farm. 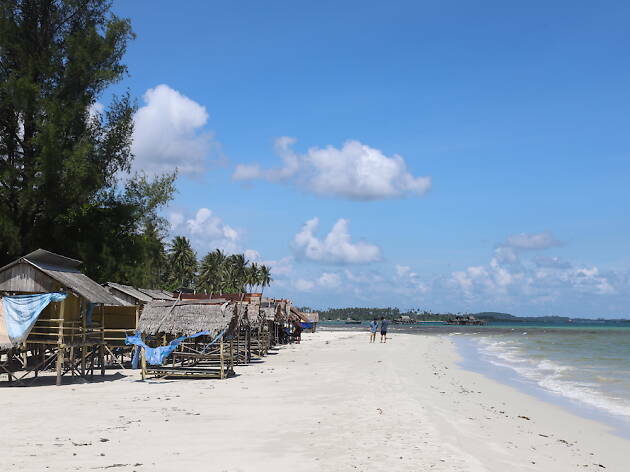 Slap on some sunscreen for a gorgeous stretch of separate beaches numbered one to four at Trikora which is an hour long ride from Bintan Resorts. The sand are close to white and the waters are a beautiful shade of blue and green. 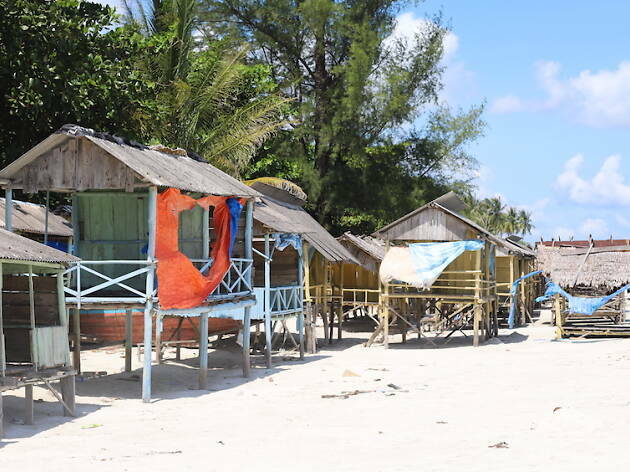 There are little sheltered huts along the shore that are popularly rented by locals during weekends for seaside picnics – as well as taking refuge from the merciless sun! Drop by a local boat-maker and observe how traditional fishing boats are made. 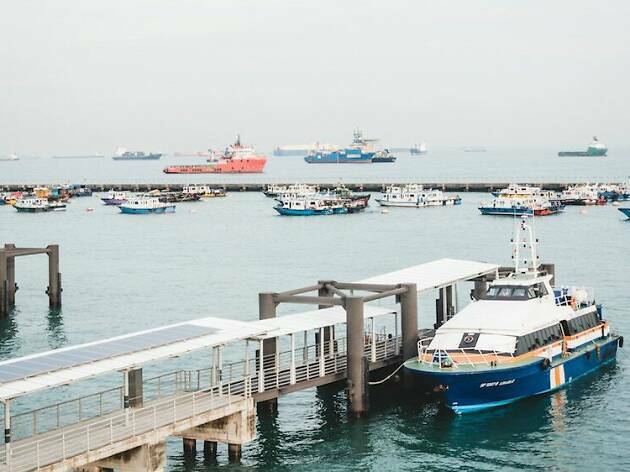 The best way to get to Bintan is via ferry which is operated by Bintan Resort Ferries, departing to and from Singapore’s Tanah Merah Ferry Terminal to Bintan’s Bandar Bentan Telani Ferry Terminal. Visit brf.com.sg for more information and bookings. 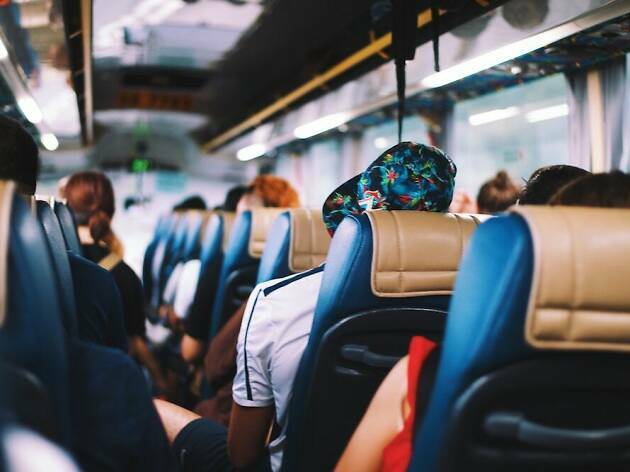 There are complimentary shuttle bus services that run regularly between the resorts, Bandar Bentan Telani (BBT) Ferry Terminal, Plaza Lagoi and Safari Lagoi. Visit bintan-resorts.com for the latest updates.